Christian ethics is less a system of principles, rules, or even virtues, and more of a free and open-ended responsible witness to God's gracious action to be with and for others and the world. Postmodernity has left us with the risky uncertainty of knowing and doing the good. It also leaves us with the global risks of political violence and terrorism, economic globalization and financial crisis, and environmental destruction and global climate change. How should Christians respond to these problems? This book creatively explores how Christian ethics is best understood a witness to God's action, thereby providing the ethical framework for addressing the various problematic social issues that put our world at risk. 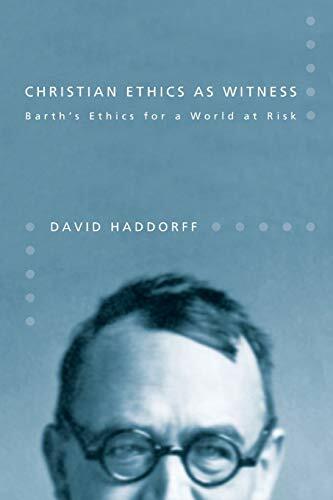 Haddorff develops the notion of witness through a detailed study of Karl Barth's theological ethics. Barth, he argues, provides a language enabling us to know what a Christian ethics of witness actually looks like in both theory and in practice. In correspondence to God's gracious action, Christians remain free to think and act in faith, hope, and love in respondence to their unique circumstances, even in a world at risk. In their witness, Christians remain confident that God has not abandoned the world but loves and cares for its future. David Haddorff is Associate Professor of Theology and Ethics at St. John's University, New York. His previous works include Dependence and Freedom: The Moral Thought of Horace Bushnell and a lengthy introduction on Barth's political theology in the reprint of State, Community, and Church (Wipf and Stock).